Here's another idea: for every chart you make, make a more abstracted chart that will provide new entries once those in the first have been used up. The good thing about a more abstracted "spur" type chart is that it can generate scores more results and how you interpret those results can very from day to day (and whether you get help from your players) meaning even more possible results. The bad thing is that it requires that you interpret those results. And that requires some confidence, mental clarity, and maybe time and some of them may just end up being duds. The good thing about the specific chart is that you can put what you know are the most badass, fun, and appropriate to the unique qualities of that topic. The Bad thing is you may not be able to think of all the most badass possibilities. Or, you may just use them up in play. And then what? Make both. Now, that means more work, but you want the best "What the Gnome Bard Has in his Pockets" chart possible right? The unspoken assumption (when it isn't explicit) seems to be that a DM will design at least a continent, decide on geography and terrain types, maybe even political entities, trade routes and epic histories. Yeah, that's not how I started this campaign. First it's a ton of work. But more importantly, it makes a bunch of decisions before play that shuts off the possibility of shaping the campaign as we go, as I receive input from players, etc. It limits the ability to adapt and react. So here is quick and dirty way to put that off till later. You have a mysterious pylon appear near civilization. In it is a control room with little dioramas of various places that appear to be ruins. Working various levers/switches allows for travel to these locations. There is either a similar pylon at the location, or a simple mechanism for returning directly (break a crystal, chime a gong). (yep, like video game fast travel-- though you might decide later that some of these locations are actually in different times or planes [they didn't fit in your conception of this campaign world]). Now you can have 2-10 locations that are whatever seems coolest to you when you start, or, whatever module you want to use, and you don't have to worry about where they're located in relation to each other or how they fit into your world's history. If players decide to come back from a location the old-fashioned way, by land/sea travel, you'll build the world as they go. Otherwise, you have time to decide what you want the greater world to look like while the players are exploring these hot spots. Essentially it's a stalling technique that allows fun play now that can still be situated in your world to whatever degree of simulationism you desire later. What tool could you make that would help others do better at that same thing? What are the Monsters Doing? Okay, some of those are not actions but states of being (trained, diseased) but you get the idea. I wouldn't make this mean the encounter is necessarily harmless, just distracted perhaps. And if you start taking pot shots at them it turns into your typical skunkbat strafing run. Because you know you play D&D to imagine young beholders frolicking. It isn't a real skunkbat after all, someone must be hunting them. Or it's a mechanical wonder. If you catch it might be worth a lot. What would the display of a gelatinous cube be? Iridescent colors playing across its surface? Or maybe it fluctuates between sphere, cube, and toroid shapes. Like mountain goats butting each other for superiority ( or flailsnails! ), or maybe like crows mobbing a hawk. You really wanted to see a dragon, right? Well, these skunkbats are trying to drive one off. Okay, no, you play D&D to experience the miracle of beholders being born. Happening daily this season at the beholder calving caves. Lots of weird possibilities here, think zombies, men and women of wounds, etc. Ever heard of migrating tarantulas? How about grunion runs? See, these particular gelatinous cubes aren't interested in eating you, they're just trying to get up-dungeon like transparent, cubic salmon. Multiply the number encountered by 10. Wearing collars or ribbons, these things could be worth money, or it could mean their masters are nearby. Maybe someone uses stirge like hunting falcons. Also, can you train a gelatinous cube? Okay, this is not about frequency of random encounters in a dungeon. I delved into that here. This is more about variety. 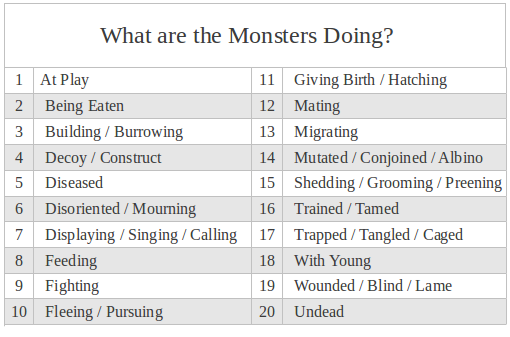 What I'm curious about now is: How many types of distinct creatures are on your wandering monster table? And, also, how likely is it to encounter each? I'm asking because I'm trying to streamline my DMing. I was thinking of even pre-rolling encounters and having them appear one by one as encounters occur (I'm pretty sure I saw this in action on Jim's Carjacked Seraphim blog). I actually like better not knowing as a DM what will show up. But I tend to forget how many stirge attacked the party, and in worst case scenarios I'll lose track of which creature had been hit/how many hp they have left during the combat because I'm just scrawling on scratch paper. I've tried the using-8-siders to keep track but this assumes you have a nice clean space at a table to keep them separated from your regular dice. I'm usually standing or even perched over a sliver of end table. Anyway, if I have only 4 to 6 types of monsters to randomly encounter, maybe I can pre-roll several different batches of stirge and have them ready to roll. So I'm wondering if your tables are sparse like that or tend to be d20 or d100 affairs. Any other details on tracking hp/xp would be of great interest too. Okay, I'm off to forage on the tundra (Skyrim). I'm at the folks', on a guest account. Had a couple ideas I thought I'd share. See, I'm never as organized as I want to be with my game stuff and I have to carry everything to someone else's house so the fewer papers I have the better. Also, the fewer bits of paper I have to fiddle with during play the better too. I try to have a map on one side and an random encounters key sheet on the other in a report cover. That way I can carry it with me if I pace around, whisper in a player's ear, or close it when we take a break. But invariably there are other things I need to access: npcs, monster hp tracking, random tables. If I could compress some of the data it would help. So, what if I print my map on a thicker bit of paper and cut flaps in the major encounter areas. Then if players go there, I fold open the flap and the info on the creatures/features is right there. This could be printed on the back side of the map or, if, it's easier, on another bit of paper stapled to the map. Another idea is to print business card size room contents and staple or paperclip them to the back of the map near their encounter area. I think this, while cumbersome, might help in two ways: 1) I wouldn't have to go rifling through papers searching for monster hp 2) I could keep track better of what players fought for xp purposes-- put a check mark on the ones they've killed and stash them all in one place for after game tallying. I could have treasure troves ready made in lettered envelopes, then just have a letter on the business card. Not as elegant as I'd like but I might try one or the other to see how it works for me. Here's another waking-up-from-sleep idea: A long forgotten cult knew how to extract and distill knowledge into liquid form. Somewhere there is a library of what is left of their art. Tiny vials hold passphrases, bottles maps, and casks the genealogies of extinct families. Far in the back, through double doors, is an entire lake. And a woman who has been there for decades, trying to drink it all. I've never used this, don't know how useful it would be, but as I was falling asleep last night I thought of giving a player a sealed envelope with "Open When __________" written on top. So let's think about the possibilities. What could be the triggers? Let's pause there and think about some reasons you might do this. Because with the last one I realized you could set up some real tension for a player-- should they seek out water or desperately avoid it-- if you make the triggers something they have control over. And that's a great meta reason. But what are some possible in-game reasons for the sealed message? Okay, I also thought last night of printing a pocketmod with taped together pages. The cover would be a trigger, the first page the info revealed, the second page would be an additional trigger, and so on.Why? I don't know it just seems like it would be incredibly intriguing. You could make something happen based on player choices, but shrouded in mystery. Maybe the little booklet is for spell research-- "Open page if you spend more then 2000gp", or "Open page if you fail to maintain your experiment with 1000gp per session." Or maybe this could be an abstracted way to deal with an npc relationship that isn't really the focus of the whole party, maybe a romance. Is a mobile trap just a monster? If traps are meant to keep folks out of certain areas is a moving trap just a patrol like a guard or robot? maybe it follows the party from room to room making things more difficult somehow. maybe it makes a timed sweep through the dungeon and knowing its path and timing could be a kind of treasure map players need to find or info to get from npcs. I'm thinking of Labyrinth now, weren't there rolling grinding machines? a mobile trick I have an easier time imagining, a fountain on wheels, an altar that teleports. One reason is if players discover that they grant a boon, needing to find them later would be a task. Or, I'm very interested in squeezing more exploration from the same location (see tumbling dungeon) what if this mobile trick did something to a room that made the room different? Infrared light that reveals runes on the walls. Floor level fog that hides holes in the floor. Soft music that obscures the soft ticking of secret mechanisms (find secret doors). Heh, what if the mobile trap was just a cage that traps a pc and then travels slowly through the dungeon making it hard to find and free them? I have no idea why the maker would want that, maybe a crazy mage. Oh, maybe it was some kind of practical tram that has gone haywire. If the players figure out its buttons they can toodle wherever they want in the dungeon in relative safety, but experimentation might just dump them in the troll den. Back to the mobile room changer- anti-gravity seems like a good one, two dungeons for the price of one mobile trick.Very similar to the tumbling dungeon idea except the people tumble not the dungeon. trying to come at it from the simulationist why-would-it-be-there-angle: maybe that wandering fountain is a kind of aid station/refreshment center in the dwarven mines, rotates through the shafts efficiently so that work never stops in more than one place at a time. Maybe gather data on the denizens-- a watcher in a prison, a kind of nature observer set by a mage guild in a monster ecosystem. Perusing the data could help players crack the patterns of a dungeon. Cleaning! That seems obvious now, brushes pushing pcs out of rooms, water sprays hosing them down, heat to sterilize. Are gelatinous cubes just mobile traps? Okay, that's all I got right now. Hope you're having a great weekend. "How else could you structure and/or connect a sequence of encounters? By this I mean, what’s the actual interaction — mechanical or otherwise — which happens at the table which moves you from one combat encounter to the next. And this is, of course, the simpler version of this question. Remove the assumption that you’re moving from combat encounter to combat encounter, and suddenly we’d also have to take into consideration how each “chunk” of content is structured… and how are we deciding what an appropriate “chunk” is? This is an area that I don’t feel gamers actually give much conscious thought to: We’ve learned a few forms subliminally and by chance, but because it’s largely an invisible bias we rarely consider whether there might be a better way of structuring scenarios." First, this reads to me like a person who hadn't heard of D&D until they bought a copy of fourth edition. The assumptions here are 1) the game is encounters, and encounters are combat, 2) a DM's job is to orchestrate those encounters, 3) this is what gamers expect. Second, I've seen Alexander comment on OSR blogs, he must know this community exists. And, unless I am horribly misunderstanding this, how has the OSR not explored the questions he poses repeatedly and innovatively? The whole discussion of Western Marches style campaigns and the constant investigation of sandboxes is about how players interact with the game world and how they "encounter" stuff right? Or if you want to zoom in and be a little less granular you can look at the dungeon map and all the discussions of chokepoints and Jaquaying the dungeon (a term Alexander invented!) . Heck, even my posts on door priority and heat maps were trying be aware of how players interact and make choices in a dungeon thus leading to or avoiding "encounters." And now I'm just remembering the fascinating examination -C started with the quantum ogre, that was thinking about "encounters" and their relation to player choice and agency. So it seems he is completely wrong about assumption 3; some gamers have spent a great deal of brain cycles thinking about what players encounter in the game, how, and why. Now I want to look at the other two assumptions. Players can encounter lots of things while playing an rpg, from descriptive details (the dungeon ceiling is covered in damp moss) to violent physical conflict. You could set these on different continuums depending on what you want to privilege. Are you more concerned with things that can kill pcs (That is a pretty big one)? Then you'll have things like dungeon dressing on the less important end of the scale and creatures that attack on sight on the other. But, that dungeon dressing could be very related to mortality if it's hiding traps (a spiked grate falls out of all that moss), or if it's a signpost suggesting danger lies ahead (it's getting hotter and hotter). And also, are you sure player mortality should be supreme concern? Getting taken out of the game is a big deal, but surviving to play in a dull, plodding game is a pretty big concern too. So you could chart out a different continuum that goes from less important to more important in relation to: engaging players, creeping them out, making them feel empowered with choice, or allowing them to exercise their own creativity in the campaign world. Privileging any of these would result in completely different discussions and different ideas of what an encounter is. But people almost always focus on combat. What about encounters with sentient beings that don't want to fight? Heck, what about a speaking thing that players can't engage in combat even if they want to, like, say . . . a giant stone head. Sound familiar? Is that Castle Greyhawk classic not an encounter? What about two other classic dungeon features, traps and fountains? Traps can be telegraphed and then players get to be creative trying to circumvent them. Fountains are a temptation and an example of the mysterious underworld that players can choose to engage with or not. It would be nice to have the tension of combat encounters make time an element when dealing with the traps and possibly make players desperate enough to drive them to drink from the fountains, but I propose you could have an entire dungeon with no combat encounters at all, just traps and magical fountains. In fact, I challenge you all to make one. What about the lowly "Dungeon Dressing"? The term implies you could run the dungeon perfectly without it. Or that you might replace it with entirely different details according to whim. I think this is wrong. I propose that if you're "dressing" is dispensable, you don't know what it's for. Even if you just want your dungeon to be weird, there are different flavors of weird. These details can help one location feel different from another, help define the denizens of that place, can set the mood or tone of the exploration, as well as making the place seem tangible and plausible. So I guess what I'm saying is that even the lowly dungeon detail often dismissed as "fluff" is an encounter with the imagined world and to only focus on the things that can swing an axe at you is missing a lot of the point of the game. Who decides when an encounter becomes an encounter? Players in my last session went into an abandoned monastery and saw lots of odd, otherworldly things. Whether these would become combats was not a cut and dried as latter day gamers like to make encounters out to be. The party found a monk's body stuffed entirely with feathers, but approaching it, they thought it might be undead ready to spring at them. They prepared themselves for what might be a surprise combat. The party also encountered a little man riding a pug with reins in the dogs mouth that ended in fish hooks. This little man gestured and rode off into the darkness. While I had it appear mostly for atmosphere, had the players pursued, shot missile weapons at it, or cast a spell, I would have allowed it-- it was real enough to be engaged. They could have turned that and several other experiences they had in the dungeon into combat encounters and chose not to. In mentioning the little pug-rider, I want to point out something I realized in that last session. I actually determine what players encounter in three different ways: 1) I tie things to a location on the map. The sick bear is behind the alter in the chapel, it doesn't roam. There are plenty of details that indicate a large smelly animal is in there, but if the players don't go there they won't ever see it. 2) I roll for random encounters. A sick wolf wanders the halls, as do rats and stirges. Now the list of things that might be encountered was crafted by me to fit the location, but if and when they occur is entirely out of my hands. 3) I had several mobile, set pieces that I employed at times I chose. The kobold riding the pug, the lost little girl. These appeared when the toughest pcs are engaged investigating inside a monastic cell, leaving the weaker members of the marching order in a hallway with darkness on two sides. I intentionally employed these to try and make my players feel vulnerable, to show them they were not in control of this environment, they were interlopers and in danger. Now, we're all familiar with random encounters and certainly with static location based encounters, but I stumbled into that third, when-I-thought-it-best-to-happen mechanic on my own. And I like what it allows me to do. But I would never just make stuff happen off the cuff any more than I would pre-script battles in a certain order the way the Gamma World adventure Alexander is reviewing does. It seems to me that a DM will want to use all three of these tools for determining what players experience-- the static, the random, and the DM orchestrated-- at the same time. The first makes locations and choices about exploration real, the second is what story emerges from-- surprising even me and making the world seem alive, the third allows me to do something a computer game could never do-- make things happen based on what I'm observing players are feeling. I think a good DMing "how to" would talk about how to get these three methods working together. After writing this (it took several work mornings) I think I have a better idea why latter day D&D focuses so much on pre-prepared, balanced, combat encounters. It's hard to DM. It takes some sensitivity to notice a certain player is getting left out and then make them be the one that sees the creepy girl in the shadows. It's hard to design dungeons. At least, a dungeon that has danger and emptiness laid out in a way that lends itself to creating rising and falling tension in a group of players. It's hard to have faith in a random dice roll, "What if something comes that kills everyone?" I realize that the scientific systematization of D&D into pre-scripted combat encounters is about control. But I think this approach, while comforting, is a gross oversimplification. Like thinking writing can be parceled into discrete types-- persuasive, descriptive, informative-- or that people are different brained-- left, right-- or that taking vitamins will help you with a cold, oversimplification gives you the feeling of control while misunderstanding the complexity of the world underneath. Trying to reduce D&D down to a set of prepared, carefully controlled combat encounters can be done, but the D&D it results in is a pale image of the D&D that is possible. I have a one page disease pretty much done, just need to nail down the contagiousness and fatalness of each. Our session on Friday went swimmingly. I was concerned because this batch of players was going back into the Monastery of St Eudo, which had been pretty much cleared before. That place is all about creepy redcap-like kobolds and goblins. I wasn't sure if repeating the same creepy scenes would be fun for me, but it was. And knowing the scenes I could focus more on when to make them happen and who would witness them. I rolled on my creepy combat commentary chart to give the things different personalities. The masochist was pretty creepy. I didn't get a chance to finish tweaking the Nidus shopping charts before play. The way it works now, you roll to see if you find what you want and then you roll a wonder to see what you encountered during the search. The second step saves the whole set up, because players would be frustrated trying to locate a jeweler and then laugh, or be creeped out, by the weird stuff they saw. I bought Skyrim. Times are monetarily tight, but I figure I'll save money on the beer I'm not drinking while I play the game. Thoughts so far? Quite nice, the dragons are impressive and scary, I find it engaging to just roam around hunting deer, collect plants and insects, and smithing stuff. But they scaled the damn world again. I'm intentionally not leveling up because I don't want all the deer and wolves in the world to inexplicably transform into bears and trolls as I get more powerful. Surely I'm not the only one? In Oblivion, past a certain amount of scaling, horses became useless because trolls and minotaurs would kill them out from under you wherever you rode. In Fallout 3, I never explored the entire map because I leveled to the point that everywhere you went was teeming with deathclaws. Surely the gain from leveling a world is less than this loss of these things. 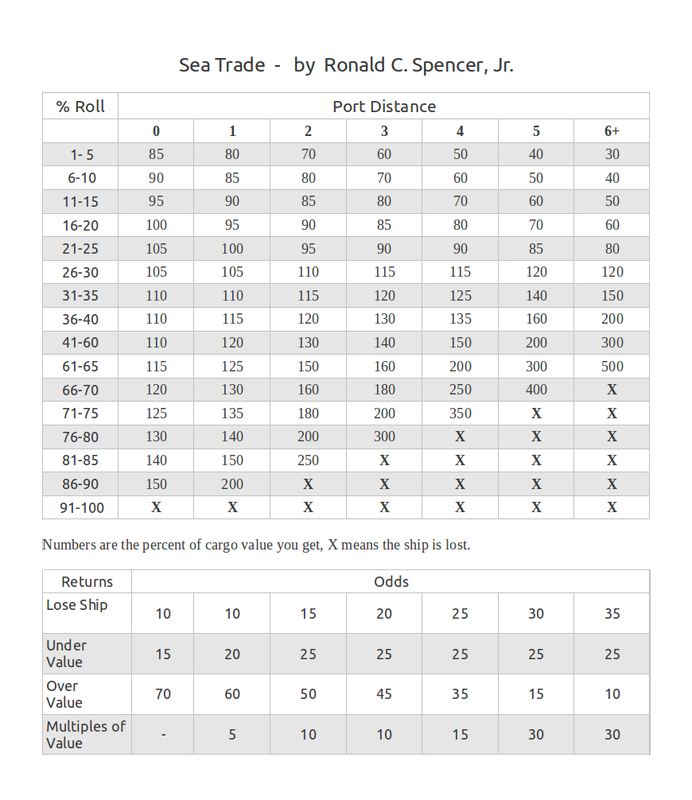 This is the sea trade system from Dragon #6 Ωmega mentioned in my previous post. I've read it before, but, looking back, I have to say I'm impressed. The whole thing fit on one page, was clean, and easy to understand. Kudos to Ronald C. Spencer, Jr. It feels very DIY OSR to me. I've reformatted the data here for scholarly purposes. I changed "Ports Skipped" to "Port Distance" (it just makes more sense to me, unless there's some kind of race for time related to profiting). I've also tabulated the returns and odds in a second chart. As you can see the sting of failure is ameliorated by including the brutal chance of ship loss with just getting poor returns on your cargo. The biggest risk giving a 35% for the former, 25% for the latter. But if you take that risk, you have a 5% chance of getting one of those dreamed of 500% returns on your investment. I don't think I would use this as is. The minimalist in me wants to at least cut it down to short, medium, and long hauls. But it's cool to see what they thought the probabilities should be. If you can get a hold of a copy, the system also includes simple rules for pilot fees, time spent, and import taxes. Cool stuff. I'd never heard of the term Magic Circle in regards to games before, but ran into it in a discussion on Metafilter today. The explanation on Wikipedia had me thinking about the recent post by -C on player assumptions. "Castronova uses the term 'synthetic world' because a synthetic world 'cannot be sealed completely; people are crossing it all the time in both directions, carrying their behavioral assumptions and attitudes with them.'" If you think of each campaign along with whatever ruleset is being run as a "synthetic world" then players moving from one campaign to another would be similarly carrying over assumptions from one world to another. Sounds pretty obvious, I guess. But it's interesting to me that video games might drive scholarship that can apply equally to our rpgs. Other thoughts, the flailsnails conventions and the conversion rules in the 1e DMG seem to be the analog of this allowing of movement between circles, but I find it hard to imagine video game companies doing that now. Though it would be cool to head West in Fallout 3 and end up in New Vegas, or to head North (?) in Oblivion and reach Skyrim. Even the old Baldur's Gate games allowed some of this. Is it just console games that allow no transfer from circle to circle? You can't take a Sim from the Sim 2 PC game to Sim 3 can you? I realize there's a big difference in technologies from one title to another but find it curious that there is no market for sequels that a person could take a character through. Note, no mention of MMORPGs from me because I have zero interest in paying a monthly fee to grind (to be honest, I'm sure my lizard brain I would get wrapped up in it, but my rational brain has so far prevented this from happening). What's the simplest system we could come up with for trading goods by sea that would still have some of the flavor of the real deal? I figure some of you are very knowledgeable about this stuff (looking at you richard). I'm thinking 3-4 tiers of. More risk = more return. More risk will mostly = ports farther away. 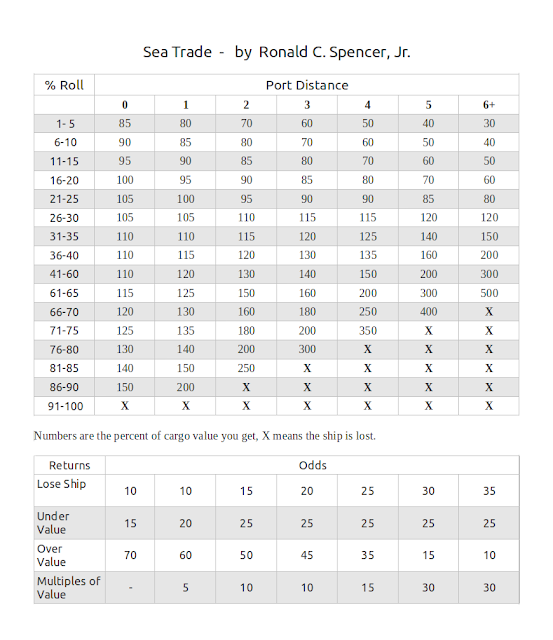 Maybe have the player roll each session we play to check on the trade voyage's fate. 1. What should the probabilities of succeeding be for low, medium, high risk? If you stick with a single d6 and have the roll be 4-5-6, 5-6, or 6, that would be a fifty-fifty chance of losing a cargo even at the lowest risk. 2. What returns should I be looking at? I'd like no chart necessary, so numbers like +10%, +25%, +50% are more attractive, because I can do them in my head. I have no idea if those are way too much or too little. If we stick to general rates of return based on distance, we can decide later what ports have what goods and just plug them in and you could always layer shortages and rarity on top of the basic system bones. Yeah, I realize this could ruin everything and let people make their fortune without needing to enter dungeons. But investigating the loss of a vessel, or even traveling on your own trade vessel à la Sinbad, is right down my campaign's alley.